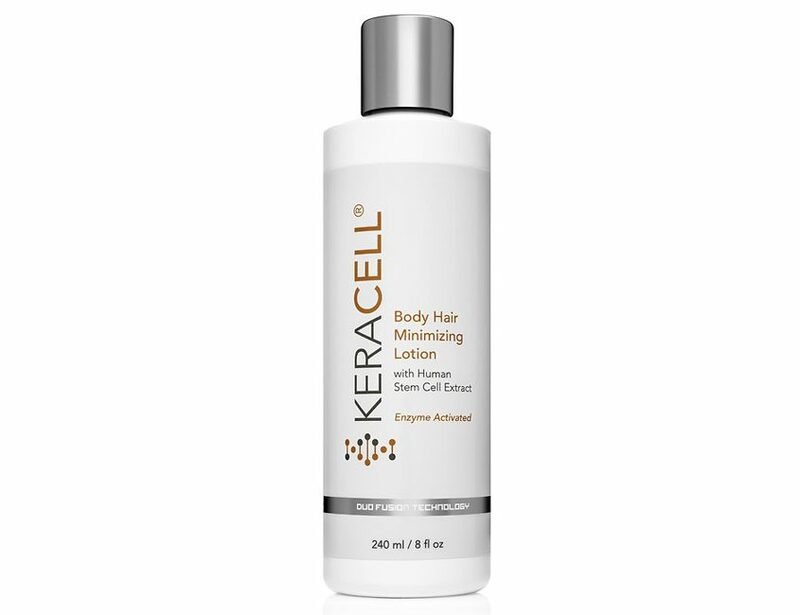 KERACELL® Body Hair Minimizing Lotion with MHCsc technology contains PilisoftTM which is an extract derived from the leaves of Gymnema Sylvestre and rich in gymnenic acids, successfully prolonging and enhancing the effects of hair removal treatments. Its innovative mechanism of action is based on the important role gymnenic acids play in the inhibition process of hair follicle activity. Tests have demonstrated its ability to reduce keratinocyte proliferation and impair the mitotic activity of hair follicles. Its efficacy on both slowing hair growth and reducing hair density has been confirmed by a clinical study with significant results obtained over a one-month period. It also contains Depil EnzymeTM a keratin specific enzyme derived from a fermentation process that helps to “digest” newly formed keratin protein into peptides, which are then easily rinsed off when you shower. Enzyme Activated. Deionized Water, Helianthus Annuus (Sunflower) Seed Oil, Sodium Acrylate/Sodium Acryloyl Dimethyl Taurate Copolymer (and) Cetyl Alcohol (and) Glyceryl Stearate (and) Capric/Caprylic Triglycerides, Subtilisin (Enzyme), Hydrolyzed Rice Protein (and) Water (and) Prunus Amygdalus (Sweet Almond) Seed Extract, Pentylene Glycol (and) Gymnema Sylvestre Leaf Extract, Hamamelis virginiana (Witch Hazel) Bark/Leaf/Twig Extract, Salix alba (Willowbark) Extract, Cyclopentasiloxane, Dimethicone, Glycerin, Propanediol, Polysorbate 20, Olea Europea (Olive) Seed Oil, Vitis Vinifera (Grape) Seed Oil, Butylene Glycol (and) Vibrio Alginolyticus Ferment Filtrate, Human Stem Cell Conditioned Media, Ethylhexylglycerin (and) Caprylyl Glycol, Xanthan Gum, Natural Fragrance. Apply to freshly cleansed skin for optimal performance. Massage onto areas of the body where you want to minimize hair re-growth. May be used after waxing or shaving including on intimate areas. Use daily for best results.Apply to freshly cleansed skin for optimal performance. Massage onto areas of the body where you want to minimize hair re-growth. May be used after waxing or shaving including on intimate areas. Use daily for best results. CAUTION: If you have sensitive skin, test product on a small area first if you are using it immediately after shaving or waxing.